Lawn Fawn's October inspiration week is ongoing, with a closer look at the new Perfectly Plaid Winter paper collection. I mixed a pattern that sits diagonally with a grid pattern sheet for extra fun. It's a simple card that comes together in a snap, but looks more involved because of all the pattern. The focal point is a simple scene of a penguin decorating his igloo for Christmas. All images are from Snow Cool. I hope you like today's card! There's more to see on the LF blog this morning - click! Very cute, like the sentiment you choose to go with it. Seriously, that penguin is so stinkin cute! 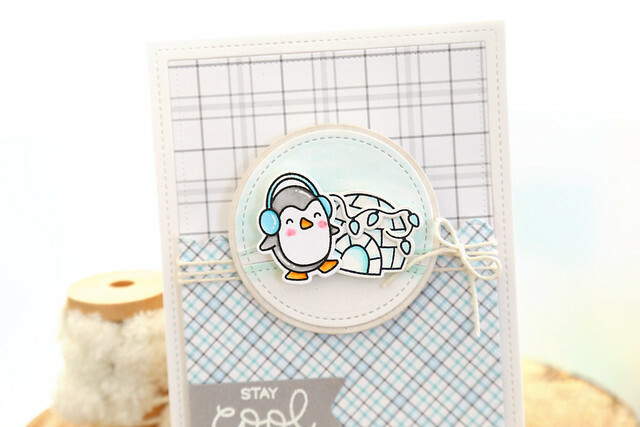 Such sweet cool plaids with the Snow cool set! Perfect match!